OnePlus 6T will be announced on October 30, the company has confirmed. Less than six months after OnePlus unveiled its hugely-impressive OnePlus 6, the firm has a new handset ready to launch worldwide. Dubbed OnePlus 6T, the next-generation smartphone will be announced at an event in New York City. Like the OnePlus 6 launch, OnePlus fans will be able to attend the launch event to get their hands on the handset ahead of its release date. Early Bird tickets for the OnePlus 6T launch are available now and will set you back £16 ($20) each. The discounted ticket offer ends tomorrow, October 9 at 1pm BST, with ticket prices then set to increase to £23 ($30). As with past launch events, attendees will receive a special bag at the event packed with OnePlus-branded treats and memorabilia. The goodie bag looks set to far exceed the price of the ticket, given that OnePlus has confirmed it will include a pair of £69 Bluetooth-enabled Bullets Wireless earbuds. For those who don't fancy coughing-up for the live event, OnePlus will be streaming the launch event at oneplus.com/6T/launch. OnePlus' press conference starts at 3pm BST on Tuesday 30th October, 2018. 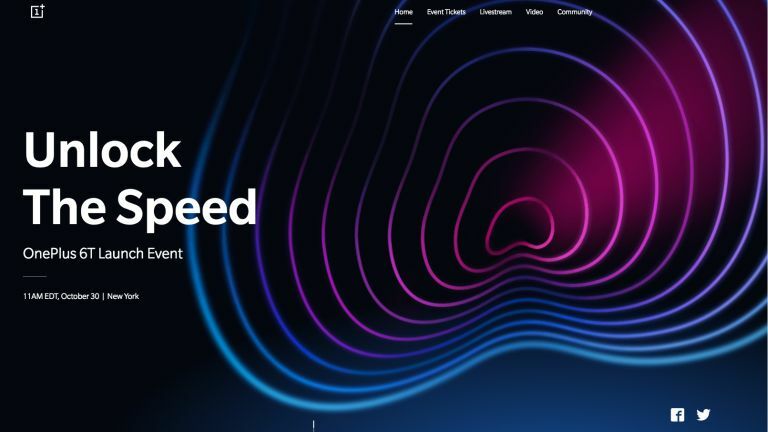 The launch date confirmation comes days after OnePlus published a new teaser trailer for the OnePlus 6T, dubbed “Tap Into The Future”, which offers some new details about how the in-screen fingerprint reader will work. It revealed the OnePlus 6T will illuminate a glowing fingerprint pattern in the lower-third of the display to highlight where users should place their digit to unlock phone. Embedding a fingerprint reader beneath the glass display to enable an all-screen smartphone design was long-rumoured to be planned for the iPhone X, before being dropped because it was too challenging for Apple engineers. Aside from the removal of the rear-mounted fingerprint scanner in favour of an in-screen solution, we expect the OnePlus 6T to look a lot like OnePlus 6. Expect to see a display in the region of 6.3-inches, with a notch to house the selfie camera and sensors. Leaks suggest the notch will be a little smaller this time around, similar in design to the teardrop-esque cut-out seen in the Oppo F9 earlier this summer. The smaller design promises to give the new smartphone a cyclops-like appearance that could allow much more space for notification indicators and information in the status bar. OnePlus has also confirmed that its next handset will ditch the 3.5mm headphone port – a first for the disruptive Chinese smartphone startup. The phone should launch with Android 9.0 Pie as well, since the OnePlus 6 has already been updated to the latest Google mobile OS.